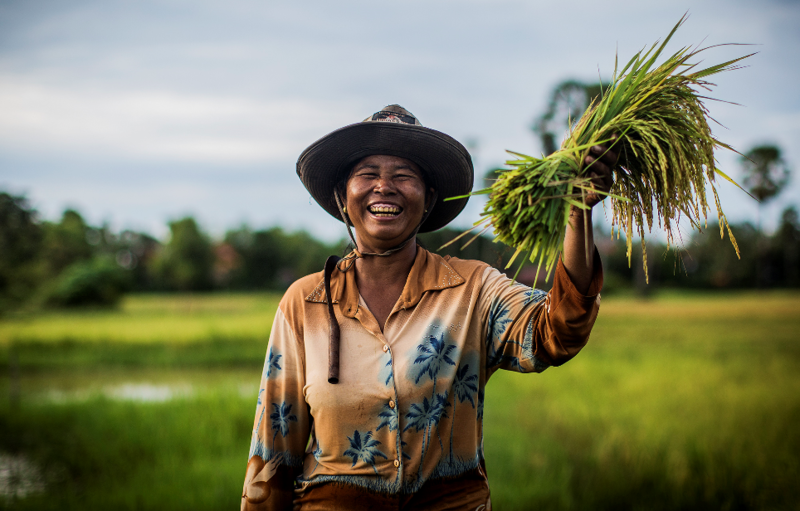 Kahm Loum, rice farmer in Cambodia supported by We Effect. We Effect is today announcing a new 5-year programme in Cambodia. It will empower 40 000 farmers to fight poverty – with a focus on gender equality. – It is impossible to end poverty, without gender equality. Promoting equal rights to own land, earn money and be in leadership positions can be a big economic drive for Cambodia, says Jennifer Vidmo, regional director for We Effect in Asia. Gender inequality is a global cause and effect of hunger and poverty: it is estimated that 60 percent of all chronically hungry people are women and girls. If women in rural areas had the same access to farm land as men, an estimated 100-150 million people would not go to bed hungry anymore, according to FAO. – We Effect have set a goal that at least 50 of the resources will go to women, and that 50 percent of all leaders should be women in the organisations We Effect support. That is the right and smart thing to do, says Jennifer Vidmo, regional director for We Effect in Asia. – In Cambodia, Sweden has engaged strongly in the promotion of gender equality, contributing to strengthening Cambodian women as key actors for successful, inclusive and fair economic and social development, and a basis for a truly rights based and democratic society where all citizens enjoy the same rights and are allowed to take on the same responsibilities. The programme proposed by We Effect is fully in line with these efforts, says Anna Guittet, counsellor of Embassy of Sweden in Phnom Penh. Working in partnership is key to sustainable development. For the project, We Effect is teaming up with local Cambodian NGO:s Community Translation Organisation (CTO), Farmers and Nature Net (FNN), and Mlup Batong. A total of 42 agricultural cooperatives and 868 self-help, savings and producer groups will be supported to get better access to the market, inclusive financing, improved farming skills and strengthened organisational development. – Being a woman leader with low education is very hard. But I am also proud, knowing that 12 communities, 586 households elected me to represent them. To promote women participation is key in poverty alleviation, says by Mrs. Kang Solay, Chairwomen of Union of Agricultural Cooperative Siem Reap Angkor, supported by the project. – Gender equality is not only women’s issue; it’s a human issue in society. Without equally constructive participation between man and women it’s impossible to end poverty in Cambodia, says Mr. Yinh Ya, Executive Director of CTO, implementing partner of the project. – The understanding and practice of gender equility will firmly contribute to the global poverty eradication, says Mr. Om Sophana, Executive Director for MLUP Baitong, implementing partner of the project. – Gender equality is not only right thing to do; but also because it is a good return on investment on agriculture. It could help dismiss extreme poverty and tackle hunger, says Mr. Pan Sopheap, Executive Director of Farmer and Nature Net, implementing partner of the project. We Effect has worked in Cambodia since 2010. In the last Cambodian programme, 2014-2017, the organisation strengthened member-based organisations to fight poverty and injustice in rural areas of Cambodia and reached out to 24 822 small-holder farmers.